What makes us human? In part, argues evolutionary biologist Mark Pagel in Wired for Culture: Origins of the Human Social Mind, language is one of the keys to our evolutionary success, especially in the context of culture. Humans had acquired the ability to learn from others, and to copy, imitate and improve upon their actions. This meant that elements of culture themselves— ideas, languages, beliefs, songs, art, technologies— could act like genes, capable of being transmitted to others and reproduced. But unlike genes, these elements of culture could jump directly from one mind to another, shortcutting the normal genetic routes of transmission. And so our cultures came to define a second great system of inheritance, able to transmit knowledge down the generations. Our cultural inheritance is something we take for granted today, but its invention forever altered the course of evolution and our world. This is because knowledge could accumulate as good ideas were retained, combined, and improved upon, and others were discarded. And, being able to jump from mind to mind granted the elements of culture a pace of change that stood in relation to genetical evolution something like an animal’s behavior does to the more leisurely movement of a plant. Where you are stuck from birth with a sample of the genes that made your parents, you can sample throughout your life from a sea of evolving ideas. Not surprisingly, then, our cultures quickly came to take over the running of our day-to -day affairs as they outstripped our genes in providing solutions to the problems of our existence. Having culture means we are the only species that acquires the rules of its daily living from the accumulated knowledge of our ancestors rather than from the genes they pass to us. Our cultures and not our genes supply the solutions we use to survive and prosper in the society of our birth; they provide the instructions for what we eat, how we live, the gods we believe in, the tools we make and use, the language we speak, the people we cooperate with and marry, and whom we fight or even kill in a war. Culture evolved primarily though language. This was the foundation of social learning. The best ideas were able to be passed on without having to reinvent them. Pagel’s take on social learning is fascinating. “Theft” became part of our culture and part of what propelled us forward with such ferocity. Social learning is really visual theft, and in a species that has it, it would become positively advantageous for you to hide your best ideas from others, lest they steal them. This not only would bring cumulative cultural adaptation to a halt, but our societies might have collapsed as we strained under the weight of suspicion and rancor. So, beginning about 200,000 years ago, our fledgling species, newly equipped with the capacity for social learning had to confront two options for managing the conflicts of interest social learning would bring. One is that these new human societies could have fragmented into small family groups so that the benefits of any knowledge would flow only to one’s relatives. Had we adopted this solution we might still be living like the Neanderthals, and the world might not be so different from the way it was 40,000 years ago, when our species first entered Europe. This is because these smaller family groups would have produced fewer ideas to copy and they would have been more vulnerable to chance and bad luck. The other option was for our species to acquire a system of cooperation that could make our knowledge available to other members of our tribe or society even though they might be people we are not closely related to — in short, to work out the rules that made it possible for us to share goods and ideas cooperatively. Taking this option would mean that a vastly greater fund of accumulated wisdom and talent would become available than any one individual or even family could ever hope to produce. This is the path we choose and our world is the result. Her inquiry into our beliefs is synthesized in Mindset: The New Psychology of Success. The book takes us on a journey into how our conscious and unconscious thoughts affect us and how something as simple as wording can have a powerful impact on our ability to improve. Dweck’s work shows the power of our most basic beliefs. Whether conscious or subconscious, they strongly “affect what we want and whether we succeed in getting it.” Much of what we think we understand of our personality comes from our “mindset.” This both propels us and prevents us from fulfilling our potential. What are the consequences of thinking that your intelligence or personality is something you can develop, as opposed to something that is a fixed, deep-seated trait? Your view of yourself can determine everything. If you believe that your qualities are unchangeable — the fixed mindset — you will want to prove yourself correct over and over rather than learning from your mistakes. If you have only a certain amount of intelligence, a certain personality, and a certain moral character— well, then you’d better prove that you have a healthy dose of them. It simply wouldn’t do to look or feel deficient in these most basic characteristics. I’ve seen so many people with this one consuming goal of proving themselves— in the classroom, in their careers, and in their relationships. Every situation calls for a confirmation of their intelligence, personality, or character. Every situation is evaluated: Will I succeed or fail? Will I look smart or dumb? Will I be accepted or rejected? Will I feel like a winner or a loser? There’s another mindset in which these traits are not simply a hand you’re dealt and have to live with, always trying to convince yourself and others that you have a royal flush when you’re secretly worried it’s a pair of tens. In this mindset, the hand you’re dealt is just the starting point for development. This growth mindset is based on the belief that your basic qualities are things you can cultivate through your efforts. Why hide deficiencies instead of overcoming them? Why look for friends or partners who will just shore up your self-esteem instead of ones who will also challenge you to grow? And why seek out the tried and true, instead of experiences that will stretch you? The passion for stretching yourself and sticking to it, even (or especially) when it’s not going well, is the hallmark of the growth mindset. This is the mindset that allows people to thrive during some of the most challenging times in their lives. Our ideas about risk and effort come from our mindset. Some people realize the value of challenging themselves, they want to put in the effort to learn and grow, a great example of this is The Buffett Formula. Others, however, would rather avoid the effort feeling like it doesn’t matter. We often see books with titles like The Ten Secrets of the World’s Most Successful People crowding the shelves of bookstores, and these books may give many useful tips. But they’re usually a list of unconnected pointers, like “Take more risks !” or “Believe in yourself!” While you’re left admiring people who can do that, it’s never clear how these things fit together or how you could ever become that way. So you’re inspired for a few days, but basically, the world’s most successful people still have their secrets. Instead, as you begin to understand the fixed and growth mindsets, you will see exactly how one thing leads to another— how a belief that your qualities are carved in stone leads to a host of thoughts and actions, and how a belief that your qualities can be cultivated leads to a host of different thoughts and actions, taking you down an entirely different road. Sure, people with the fixed mindset have read the books that say: Success is about being your best self, not about being better than others; failure is an opportunity, not a condemnation; effort is the key to success. But they can’t put this into practice because their basic mindset— their belief in fixed traits— is telling them something entirely different: that success is about being more gifted than others, that failure does measure you, and that effort is for those who can’t make it on talent. The mindset affects creativity too. The other thing exceptional people seem to have is a special talent for converting life’s setbacks into future successes. Creativity researchers concur. In a poll of 143 creativity researchers, there was wide agreement about the number one ingredient in creative achievement. And it was exactly the kind of perseverance and resilience produced by the growth mindset. We can still learn from our mistakes. The legendary basketball coach John Wooden says that you’re not a failure until you start to assign blame. That’s when you stop learning from your mistakes – you deny them. I heard about a high school in Chicago where students had to pass a certain number of courses to graduate, and if they didn’t pass a course, they got the grade “Not Yet.” And I thought that was fantastic, because if you get a failing grade, you think, I’m nothing, I’m nowhere. But if you get the grade “Not Yet” you understand that you’re on a learning curve. It gives you a path into the future. “Not Yet” also gave me insight into a critical event early in my career, a real turning point. I wanted to see how children coped with challenge and difficulty, so I gave 10-year-olds problems that were slightly too hard for them. Some of them reacted in a shockingly positive way. They said things like, “I love a challenge,” or, “You know, I was hoping this would be informative.” They understood that their abilities could be developed. They had what I call a growth mindset. But other students felt it was tragic, catastrophic. From their more fixed mindset perspective, their intelligence had been up for judgment and they failed. Instead of luxuriating in the power of yet, they were gripped in the tyranny of now. So what do they do next? I’ll tell you what they do next. In one study, they told us they would probably cheat the next time instead of studying more if they failed a test. In another study, after a failure, they looked for someone who did worse than they did so they could feel really good about themselves. And in study after study, they have run from difficulty. Scientists measured the electrical activity from the brain as students confronted an error. On the left, you see the fixed mindset students. There’s hardly any activity. They run from the error. They don’t engage with it. 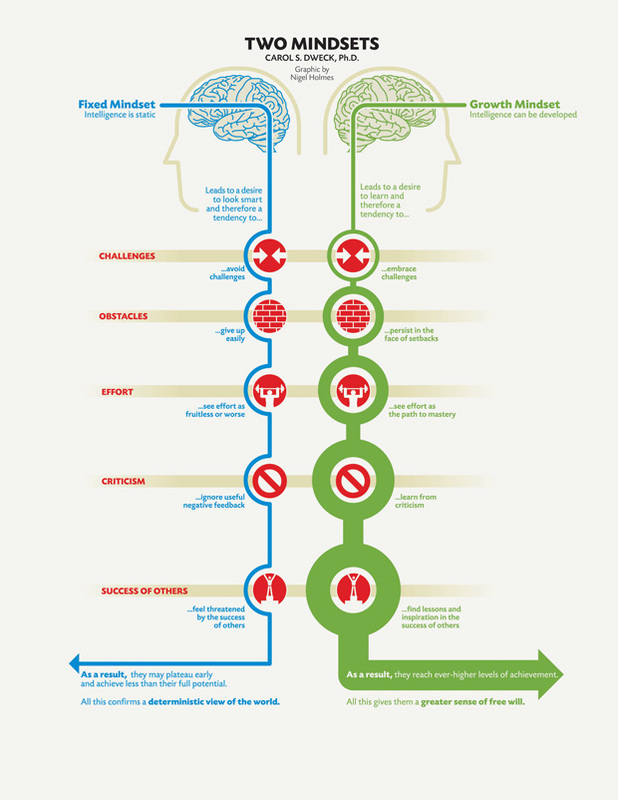 But on the right, you have the students with the growth mindset, the idea that abilities can be developed. They engage deeply. Their brain is on fire with yet. They engage deeply. They process the error. They learn from it and they correct it. It’s easy to fall into the trap of now. Our kids become obsessed with getting A’s – they dream of the next test to prove themselves instead of dreaming big like Elon Musk. A by-product of this is that we’re making them dependent on the validation that we’re giving them — the gamification of children. What can we do about this? Don’t praise intelligence or talent, praise the work ethic. … [W]e can praise wisely, not praising intelligence or talent. That has failed. Don’t do that anymore. But praising the process that kids engage in: their effort, their strategies, their focus, their perseverance, their improvement. This process praise creates kids who are hardy and resilient. How we word things affects confidence, the words ‘yet’ or ‘not yet,’ “give kids greater confidence, give them a path into the future that creates greater persistence.” We can change mindsets. In one study, we taught them that every time they push out of their comfort zone to learn something new and difficult, the neurons in their brain can form new, stronger connections, and over time they can get smarter. … students who were not taught this growth mindset continued to show declining grades over this difficult school transition, but those who were taught this lesson showed a sharp rebound in their grades. We have shown this now, this kind of improvement, with thousands and thousands of kids, especially struggling students. Mindset: The New Psychology of Success is a must read for anyone looking to explore our mindset and how we can influence it to be a little better. Carol Dweck’s work is simply outstanding.